Time to Replace Your Chaparral Boat Canvas? Only AmeritexDirect boat tops and covers will fit your Chaparral boat like the original canvas that came with it. That’s because, before many of the boats built by Chaparral leave their factory, Ameritex Fabric Systems engineers and manufacturers the canvas parts that accompany them. Bimini tops, bow and cockpit covers, mooring covers, the list goes on and on. 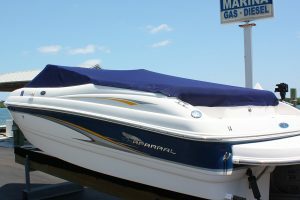 If you can find your Chaparral model listed on our easy, no-obligation quote form, that means we made your boat top or boat enclosure back when your vessel was brand new. It also means we will remake those exact same canvas parts now, at our state-of-the-art facility, and deliver them to you, factory-direct and ready for installation. Buying from AmeritexDirect ensures the best fitting replacement canvas, designed specifically for your Chaparral boat, and manufactured using the highest quality materials. That’s because Chaparral told us exactly what they wanted, and we will produce your replacement canvas to those same standards and specifications. And the price is surprisingly affordable. That’s because, even though our new canvas parts are custom sewn to order, there’s no middle man. You are buying directly from the Original Equipment Manufacturer (OEM), Ameritex Fabric Systems. You care for your boat. Protect your investment. Find out just how easy it is to restore the worn out canvas on your Chaparral to brand new by submitting a no-obligation quote request now.